You Are Loved: Inspiration from Starbucks! I can’t function without my morning cup of coffee. A Starbucks grande blonde (their light roast) sets my day on the right track. Not only do I love their coffee, but I love Starbucks mugs and collect them. So it is no surprise that I found inspiration in one of their latest mugs (shown below). The white flowers against a deep blue background on this mug are quite striking. I saw the mug while waiting in line for my morning coffee and decided to use it as inspiration for a card. 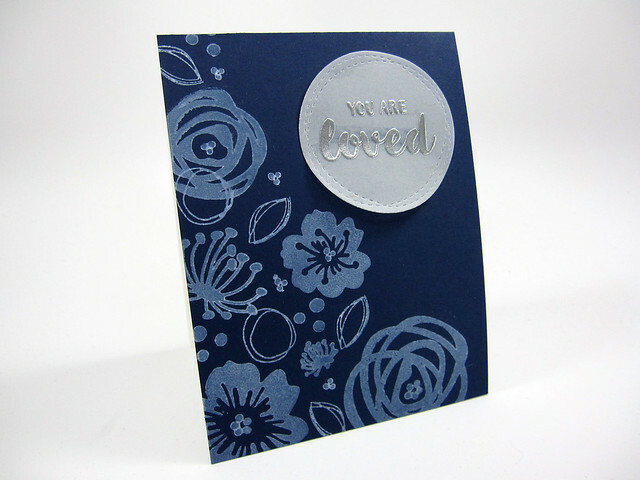 I stamped the flowers using Simon Says Stamp’s white pigment ink onto some deep-blue cardstock. At first the pigment ink seemed a little splotchy but evened out as it dried. I didn’t heat set the ink because I wanted to find out how well the ink would even out on its own and it did quite nicely. I didn’t want the sentiment to compete with the floral design, but I didn’t want it to be lost on the card either. So, I die cut a piece of vellum using a circle die. The sentiment was stamped onto the vellum using Versamark ink and then heat embossed with silver embossing powder. The sentiment came out with the right amount of subtlety without being lost in the overall design. Hope you like the card. Dies: My Favorite Things Die-namics: Wonky Stitched Circle Stax. Inks: Simon Says Stamp white pigment ink. Cardstock: Simon Says Stamp: Soft Navy for the card front; Neenah Solar White 110# for the card base; Bazzill Vellum 40#. Other: Hero Arts silver embossing powder.